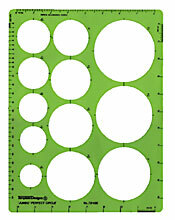 Contains: twelve circles, 1-1/4' to 3-1/2", edge scales in 50ths, 32nds, and 10ths. Size: 8-3/4"x11-1/4"x.030". with fractional and mm designations plus corner radii.